This Grilled Flank Steak with Chipotle Honey Sauce is a Mexican-style flank steak featuring lime, cilantro and chipotle chile peppers. I like to serve these juicy slices of flank steak on homemade corn tortillas with grilled vegetables and slices of avocado. You could just as easily serve it with Mexican rice and corn on the cob. Be generous with the Chipotle-Honey Sauce and you will have a delicious meal. Flank steak is an inexpensive cut of meat that is ideal for marinating and grilling. It always seems to be a very large piece of meat when I buy it so I cut it in half for two meals. I marinate one piece for dinner and the other half goes into a marinating container or plastic freezer bag. I pour the marinade on the meat and it marinates as it freezes then again as it thaws. The Chipotle Honey Sauce recipe makes a generous portion so expect to have some leftover. I put the sauce right into a Mason jar with a plastic lid and label it. The sauce will last in the fridge for several weeks. When I serve this meal the second time it is pretty quick and easy since the steak is already marinated and the sauce is ready to go. 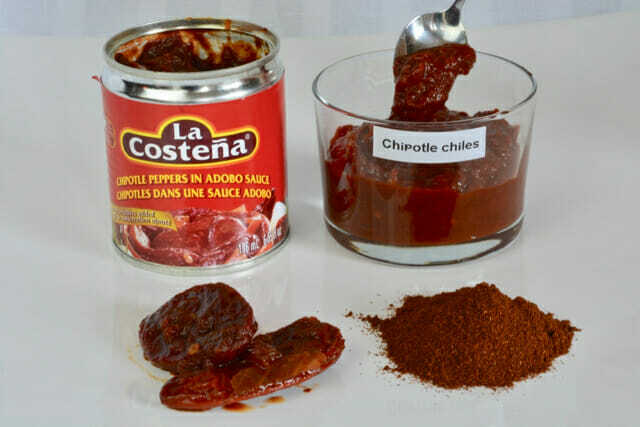 Since chipotle mayo has made its’ way onto the fast food scene everyone seems to be familiar with chipotle chiles. These smoked and dried jalapeno chiles come in a vinegar-based adobo sauce. They add a distinct, delicious flavour and heat to many Mexican and Southwestern dishes. I buy mine in a small tin and I see them in large grocery stores, specialty food shops and even in my Italian market. Of course you can also find them online. Once you start using them you will be hooked. Not all chipotle chiles in adobo sauce are gluten free. Where I live I can easily find La Costeña brand chipotle chiles and they are gluten free. I wrote more on these awesome little chiles in this post for homemade chipotle mayo which includes some more ways to use them in your cooking. Do you love these little chiles? Tell me how you like to use them in the comments below. Combine all ingredients in a large measuring cup. Microwave for 30 seconds to warm the honey. Stir until well combined. Set aside. Can be made several days in advance. Serve at room temperature. Put steak in a marinating container. Combine ingredients and pour over steak. Marinate overnight. Heat the grill. Cook the steak, turning once, for 6-8 minutes depending on thickness, for medium rare. Let steak stand, covered with foil, for 5 minutes. Slice in thin strips and serve with Chipotle-Honey Sauce.